This event class contains information about key press and release events. The main information carried by this event is the key being pressed or released. It can be accessed using either GetKeyCode function or GetUnicodeKey. For the printable characters, the latter should be used as it works for any keys, including non-Latin-1 characters that can be entered when using national keyboard layouts. GetKeyCode should be used to handle special characters (such as cursor arrows keys or HOME or INS and so on) which correspond to wx.KeyCode enum elements above the WXK_START constant. While GetKeyCode also returns the character code for Latin-1 keys for compatibility, it doesn’t work for Unicode characters in general and will return WXK_NONE for any non-Latin-1 ones. For this reason, it’s recommended to always use GetUnicodeKey and only fall back to GetKeyCode if GetUnicodeKey returned WXK_NONE meaning that the event corresponds to a non-printable special keys. While both of these functions can be used with the events of wxEVT_KEY_DOWN , wxEVT_KEY_UP and wxEVT_CHAR types, the values returned by them are different for the first two events and the last one. For the latter, the key returned corresponds to the character that would appear in e.g. a text zone if the user pressed the key in it. As such, its value depends on the current state of the Shift key and, for the letters, on the state of Caps Lock modifier. For example, if A key is pressed without Shift being held down, wx.KeyEvent of type wxEVT_CHAR generated for this key press will return (from either GetKeyCode or GetUnicodeKey as their meanings coincide for ASCII characters) key code of 97 corresponding the ASCII value of a . And if the same key is pressed but with Shift being held (or Caps Lock being active), then the key could would be 65, i.e. ASCII value of capital A . For the letters they correspond to the upper case value of the letter. For the other alphanumeric keys (e.g. 7 or + ), the untranslated key code corresponds to the character produced by the key when it is pressed without Shift. E.g. in standard US keyboard layout the untranslated key code for the key =/+ in the upper right corner of the keyboard is 61 which is the ASCII value of = . For the rest of the keys (i.e. special non-printable keys) it is the same as the normal key code as no translation is used anyhow. Notice that the first rule applies to all Unicode letters, not just the usual Latin-1 ones. However for non-Latin-1 letters only GetUnicodeKey can be used to retrieve the key code as GetKeyCode just returns WXK_NONE in this case. To summarize: you should handle wxEVT_CHAR if you need the translated key and wxEVT_KEY_DOWN if you only need the value of the key itself, independent of the current keyboard state. Another difference between key and int events is that another kind of translation is done for the latter ones when the Control key is pressed: int events for ASCII letters in this case carry codes corresponding to the ASCII value of Ctrl-Latter, i.e. 1 for Ctrl-A, 2 for Ctrl-B and so on until 26 for Ctrl-Z. This is convenient for terminal-like applications and can be completely ignored by all the other ones (if you need to handle Ctrl-A it is probably a better idea to use the key event rather than the int one). Notice that currently no translation is done for the presses of \ , ^ and _ keys which might be mapped to ASCII values from 27 to 31. Since version 2.9.2, the enum values WXK_CONTROL_A - WXK_CONTROL_Z can be used instead of the non-descriptive constant values 1-26. Finally, modifier keys only generate key events but no int events at all. The modifiers keys are WXK_SHIFT , WXK_CONTROL , WXK_ALT and various WXK_WINDOWS_XXX from wx.KeyCode enum. Modifier keys events are special in one additional aspect: usually the keyboard state associated with a key press is well defined, e.g. wx.KeyboardState.ShiftDown returns true only if the Shift key was held pressed when the key that generated this event itself was pressed. There is an ambiguity for the key press events for Shift key itself however. By convention, it is considered to be already pressed when it is pressed and already released when it is released. In other words, wxEVT_KEY_DOWN event for the Shift key itself will have MOD_SHIFT in GetModifiers and ShiftDown will return True while the wxEVT_KEY_UP event for Shift itself will not have MOD_SHIFT in its modifiers and ShiftDown will return False. Tip: You may discover the key codes and modifiers generated by all the keys on your system interactively by running the Key Event Sample wxWidgets sample and pressing some keys in it. Handlers bound for the following event types will receive a wx.KeyEvent parameter. EVT_KEY_DOWN: Process a wxEVT_KEY_DOWN event (any key has been pressed). If this event is handled and not skipped, wxEVT_CHAR will not be generated at all for this key press (but wxEVT_KEY_UP will be). EVT_KEY_UP: Process a wxEVT_KEY_UP event (any key has been released). EVT_CHAR: Process a wxEVT_CHAR event. EVT_CHAR_HOOK: Process a wxEVT_CHAR_HOOK event. Unlike all the other key events, this event is propagated upwards the window hierarchy which allows intercepting it in the parent window of the focused window to which it is sent initially (if there is no focused window, this event is sent to the wx.App global object). It is also generated before any other key events and so gives the parent window an opportunity to modify the keyboard handling of its children, e.g. it is used internally by wxWidgets in some ports to intercept pressing Esc key in any child of a dialog to close the dialog itself when it’s pressed. By default, if this event is handled, i.e. the handler doesn’t call wx.Event.Skip , neither wxEVT_KEY_DOWN nor wxEVT_CHAR events will be generated (although wxEVT_KEY_UP still will be), i.e. it replaces the normal key events. However by calling the special DoAllowNextEvent method you can handle wxEVT_CHAR_HOOK and still allow normal events generation. This is something that is rarely useful but can be required if you need to prevent a parent wxEVT_CHAR_HOOK handler from running without suppressing the normal key events. Finally notice that this event is not generated when the mouse is captured as it is considered that the window which has the capture should receive all the keyboard events too without allowing its parent wx.TopLevelWindow to interfere with their processing. Not all key down events may be generated by the user. As an example, wxEVT_KEY_DOWN with = key code can be generated using the standard US keyboard layout but not using the German one because the = key corresponds to Shift-0 key combination in this layout and the key code for it is 0 , not = . Because of this you should avoid requiring your users to type key events that might be impossible to enter on their keyboard. If a key down ( EVT_KEY_DOWN ) event is caught and the event handler does not call event.Skip() then the corresponding int event ( EVT_CHAR ) will not happen. This is by design and enables the programs that handle both types of events to avoid processing the same key twice. As a consequence, if you do not want to suppress the wxEVT_CHAR events for the keys you handle, always call event.Skip() in your wxEVT_KEY_DOWN handler. Not doing may also prevent accelerators defined using this key from working. If a key is maintained in a pressed state, you will typically get a lot of (automatically generated) key down events but only one key up one at the end when the key is released so it is wrong to assume that there is one up event corresponding to each down one. 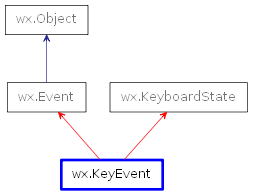 For Windows programmers: The key and int events in wxWidgets are similar to but slightly different from Windows WM_KEYDOWN and WM_CHAR events. In particular, Alt-x combination will generate a int event in wxWidgets (unless it is used as an accelerator) and almost all keys, including ones without ASCII equivalents, generate int events too. DoAllowNextEvent Allow normal key events generation. GetKeyCode Returns the key code of the key that generated this event. GetPosition Obtains the position (in client coordinates) at which the key was pressed. GetRawKeyCode Returns the raw key code for this event. GetRawKeyFlags Returns the low level key flags for this event. GetUnicodeKey Returns the Unicode character corresponding to this key event. GetX Returns the X position (in client coordinates) of the event. GetY Returns the Y position (in client coordinates) of the event. IsKeyInCategory Returns True if the key is in the given key category. IsNextEventAllowed Returns True if DoAllowNextEvent had been called, False by default. Currently, the only valid event types are wxEVT_CHAR and wxEVT_CHAR_HOOK . Allow normal key events generation. Can be called from wxEVT_CHAR_HOOK handler to indicate that the generation of normal events should not be suppressed, as it happens by default when this event is handled. The intended use of this method is to allow some window object to prevent wxEVT_CHAR_HOOK handler in its parent window from running by defining its own handler for this event. Without calling this method, this would result in not generating wxEVT_KEY_DOWN nor wxEVT_CHAR events at all but by calling it you can ensure that these events would still be generated, even if wxEVT_CHAR_HOOK event was handled. Returns the key code of the key that generated this event. ASCII symbols return normal ASCII values, while events from special keys such as “left cursor arrow” ( WXK_LEFT ) return values outside of the ASCII range. See wx.KeyCode for a full list of the virtual key codes. Note that this method returns a meaningful value only for special non-alphanumeric keys or if the user entered a Latin-1 character (this includes ASCII and the accented letters found in Western European languages but not letters of other alphabets such as e.g. Cyrillic). Otherwise it simply method returns WXK_NONE and GetUnicodeKey should be used to obtain the corresponding Unicode character. Obtains the position (in client coordinates) at which the key was pressed. Notice that under most platforms this position is simply the current mouse pointer position and has no special relationship to the key event itself. x and y may be None if the corresponding coordinate is not needed. Returns the raw key code for this event. The flags are platform-dependent and should only be used if the functionality provided by other wx.KeyEvent methods is insufficient. Under MSW, the raw key code is the value of wParam parameter of the corresponding message. Under GTK, the raw key code is the keyval field of the corresponding GDK event. Under OS X, the raw key code is the keyCode field of the corresponding NSEvent. Currently the raw key codes are not supported by all ports, use #ifdef HAS_RAW_KEY_CODES to determine if this feature is available. Returns the low level key flags for this event. Under MSW, the raw flags are just the value of lParam parameter of the corresponding message. Under GTK, the raw flags contain the hardware_keycode field of the corresponding GDK event. Under OS X, the raw flags contain the modifiers state. Currently the raw key flags are not supported by all ports, use #ifdef HAS_RAW_KEY_CODES to determine if this feature is available. Returns the Unicode character corresponding to this key event. If the key pressed doesn’t have any character value (e.g. a cursor key) this method will return WXK_NONE . In this case you should use GetKeyCode to retrieve the value of the key. This function is only available in Unicode build, i.e. when USE_UNICODE is 1. Returns the X position (in client coordinates) of the event. Returns the Y position (in client coordinates) of the event. Returns True if the key is in the given key category. category (int) – A bitwise combination of named wx.KeyCategoryFlags constants. Returns True if DoAllowNextEvent had been called, False by default. This method is used by wxWidgets itself to determine whether the normal key events should be generated after wxEVT_CHAR_HOOK processing.